Well, I’m certain that another Batman film is on its way, and if Gotham City really wants to call Batman, they can order another Electric Bat Signal from Entertainment Earth. It is powered by a plug-in, UL Adapter and two ultra-bright light bulbs, and it has a swivel feature so you can put it on whatever wall you desire. Some of you may have noticed that this Bat-signal looks nothing like the one from the comic books or movies, as there is no huge Batman insignia stuck in the middle. In all honesty, I never tried putting a signal on a spot light, but I don’t think that would work in real life. Maybe if you shined it up against something, like a wall, but if you’re just aiming it at cloudless night sky, I think the only superhero you would summon is Blotchman. Can anyone confirm whether this does or does not work? Leave a comment, please. 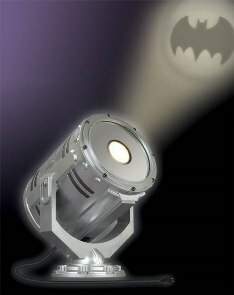 Anyway, if Gotham City wants to call Batman, then they can order this Batman JLA Trophy Room Electric Bat Signal Replica for just $258.39. Yeah, that is pretty expensive, but it is $40 off its current price and a limited edition collectible. Maybe Commissioner Gordon can borrow the money from Bruce Wayne. I made one with the bat symbol on the front of the spotlight, as seen in the movie, and no it did not work (even when shined directly on the wall). I think the bat needs to be right up against the lightbulb in order to be discernible.